Ever wonder what your therapist is thinking? Now you can find out, as therapist and New York Times-bestselling author Lori Gottlieb takes us behind the scenes of her practice - where her patients are looking for answers (and so is she). When a personal crisis causes her world to come crashing down, Lori Gottlieb - an experienced therapist with a thriving practice in Los Angeles - is suddenly adrift. Enter Wendell, himself a veteran therapist with an unconventional style, whose sessions with Gottlieb will prove transformative for her. As Gottlieb explores the inner chambers of her own patients' lives - a self-absorbed Hollywood producer, a young newlywed diagnosed with a terminal illness, a senior citizen who feels she has nothing to live for, and a self-destructive twenty-something who can't stop hooking up with the wrong guys - she finds that the questions they are struggling with are the very questions she is bringing to Wendell. Taking place over one year, and beginning with the devastating event that lands her in Wendell's office, Maybe You Should Talk to Someone offers a rare and candid insight into a profession that is conventionally bound with rules and secrecy. 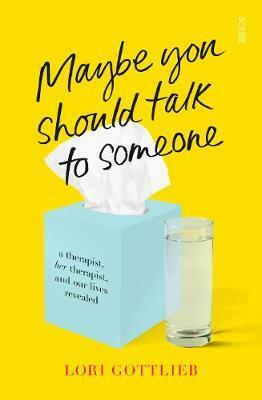 Told with charm and compassion, vulnerability and humour, it's also the story of an incredible relationship between two therapists, and a disarmingly funny and illuminating account of our own mysterious inner lives, as well as our power to transform them. Lori Gottlieb is a psychotherapist and New York Times bestselling author who writes the weekly Dear Therapist advice column for the Atlantic, where she is also a contributing editor. She has written for the New York Times Magazine and has appeared on Today, Good Morning Amer-ica, CBS This Morning, CNN, and NPR. She lives in Los Angeles. Learn more at LoriGottlieb.com or by following her @LoriGottlieb1 on Twitter.